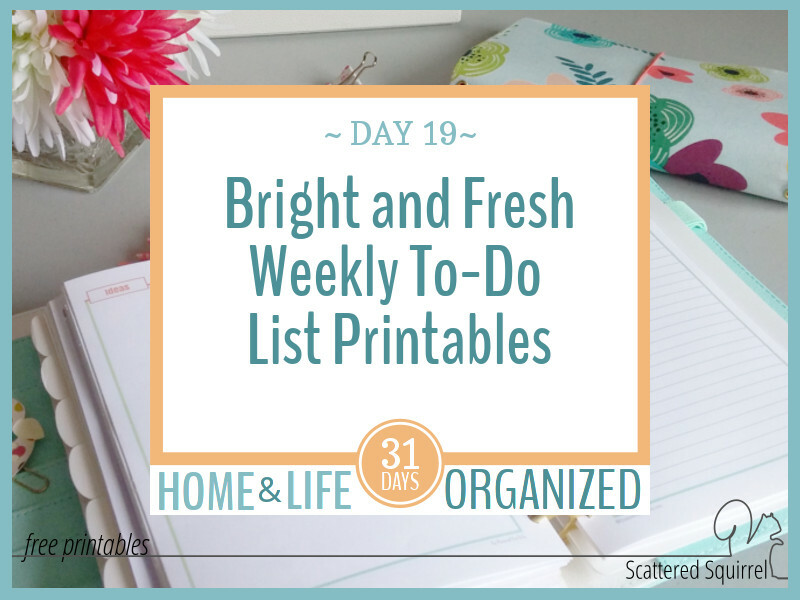 Bright and Fresh Weekly To-Do List Printables! Do you ever find yourself part of the way through the week and wishing your weekly planner layout had a little more room? It happens to me quite often, especially during busy weeks or times in our lives. That’s where the weekly to-do list printables come in so handy. I can pull one out and use it free up a little room in my normal weekly planner. It’s one of the reasons I keep a few of these in the back of all my planners. I’ve shared a few versions of these in the past and I still love them. 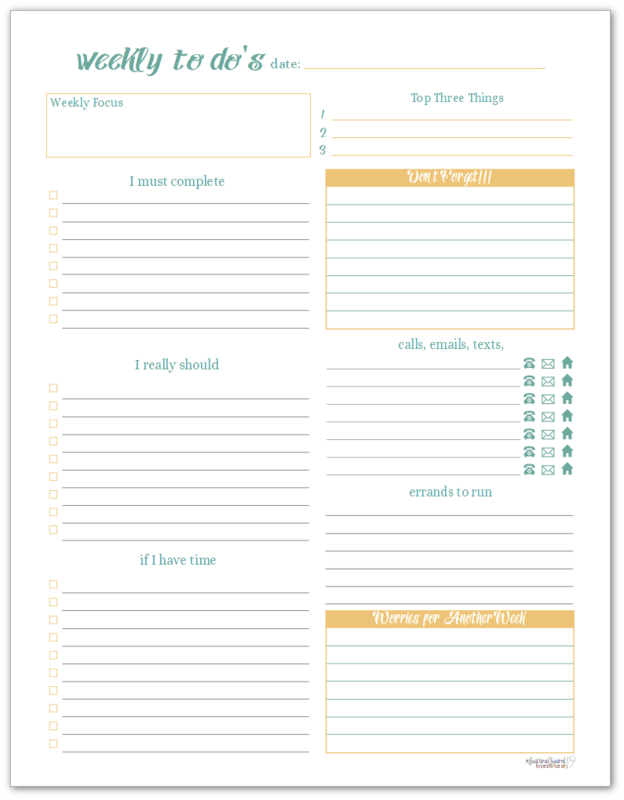 Earlier this year I was using these printables in conjunction with a daily planner. I’m a weekly planner at heart and being able to plan most of my week on one page was a huge help. As you can see, the top section is for your weekly focus and top three tasks. I start all my weekly planning sessions by setting a focus and choosing my top three things. Following that, down the left-hand side is space to jot down a prioritized to-do list. I love dividing my tasks into sections like this because it really helps me make sure I’m getting the most important things done first. The right-hand side has space to jot down reminders, note any calls, emails, or appointments that need to happen, as well as any errands that need to be run. Finally, it finishes off with one my favourtie boxes- Worries for Another Week. There is something incredibly freeing about writing something in there, knowing I don’t even need to think about it until my planning session at the end of the week! I didn’t change the layout at all when I updated these because I couldn’t think of what to change on them. If you can think of anything you’d like to see different on them, drop me a line in the comments below and I’ll see what I can do. Which brings us to the portion where I turn things over to you! I’d love to hear what you think about the updated printables. 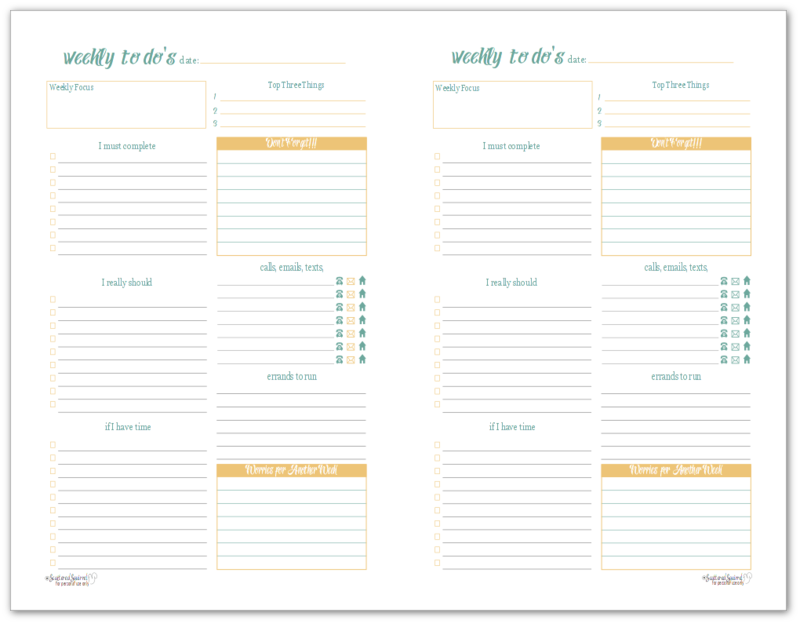 Do you use the weekly to-do list printables? Are they helpful for you? Drop me a line in the comments below and let me know. Is there something wrong with the first link? When I open it, I always end um with the half size page. Where is the A5 sized? Hi Posinoe, the link is working. Check your downloads folder maybe? If you have your browser set to automatically download files then clicking the pictures will cause the files to download. I don’t have any actual A5 sized printables. The closest to that size are the half-size ones. The full size link leads to the half-size printable – is there a link to the full sized one? Thank you! Thanks for the heads up. It is fixed and working now. I am so sorry about that. Hi Alli! Yes, now I got the right download.Yesterday I only could download the 2 pages on one. This sizing – thing really confuses me. 😉 I’m from Germany and we only got the Din A sizing (A4/A5, etc). But the first download link works perfect for me on my Din A5 Paper. I just want to say thank you for sharing, I love making my own daily planners and the stuff that you have in your ite is really helpful and love the colors. Hi Maricar, the half-size to-do list is in this post, just under the full-size one. 🙂 They sort of blend together. Sorry about that.